Irritant contact dermatitis (ICD) is inflammation of the skin that arises with exposure to certain substances. It must be differentiated from allergic contact dermatitis where the skin inflammation develops due to an allergy to certain substances. Dermatitis is a term for skin inflammation that typically presents with a skin rash (redness, swelling, dryness, peeling or scaling skin). 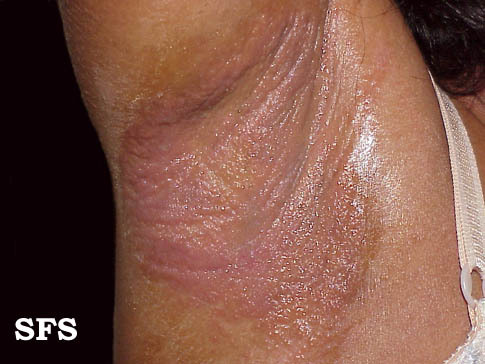 There are many different types of dermatitis. Contact dermatitis arises when certain skin irritants or allergenic substances makes contact with the skin thereby giving rise to irritant or allergic contact dermatitis respectively. Irritant contact dermatitis is known by many common names such as sensitive skin, chemical rash, dishpan hands or housewives’ eczema. The latter two terms are in reference to exposure to soaps and detergents which are more common among dishwashers and home executives. However, many of these common terms are also used to describe related skin diseases. Another term that also frequently used is hand dermatitis since irritant contact dermatitis more frequently affects the skin of the hands and fingers. It is not a specific predilection for this part of the body but rather as a consequence of the hands being in touch with various substances which may be irritants. Inflammation is the body’s response to any type of injury. It can arise with forceful impact, chemical exposure, infiltration of microbes, extreme temperatures and electromagnetic factors like UV light, radiation and so on. These types of injury causes the body to release certain chemicals which then triggers various reactions within the affected tissue. It presents as heat, redness, swelling and pain. With the skin there is the added feature of itching. The skin is a fairly resistant barrier that has adapted to withstand various types of irritants and injuries. However, excessive exposure to an irritant, high concentrations of these irritants or even short term exposure to a small concentration of a very toxic irritant can lead to inflammation. Since the outer layers of skin are dead, it is only once the irritants can penetrate the deeper layers that dermatitis sets in. Although irritant contact dermatitis is often associated with chemical exposure, it can also develop with repeated mechanical irritation of the skin. The key factor with this type of dermatitis is that there is usually a clearly identifiable irritant and it does not arise with an allergic reaction. Allergic contact dermatitis is a separate but closely related condition and it is important to differentiate between inflammation due to irritation and an allergy. Irritants in irritant contact dermatitis causes chemical or mechanical damage but the irritants in allergic contact dermatitis elicits an allergic reaction. These allergenic irritants, known as allergens, trigger an immune response in a hypersensitive person when the body identifies these allergens as being a threat to the body – often wrongly so. Although rather simplified, irritant contact dermatitis can arise in any person – some people will respond quicker than others depending on individual sensitivity, degree of exposure and the type of irritant. However, allergic contact dermatitis does not occur in every person. It is more likely to arise in a person with a history of allergies. Sometimes an allergy develops in life despite not having been present previously. The inflammatory process and symptoms are similar but the process behind irritant and allergic contact dermatitis differs. Cleaning agents such as soaps, detergents and bleaches. Saliva as is seen in dribbling babies resulting in a rash around the mouth. Urine and feces which tends to occur in infants who are not changed frequently – diaper rash. Chemical burns with strong acids and even some alkalis. Jewelry like watches, bracelets and neck chains either associated with irritation from chaffing, metal sensitivity, water and sweat trapped between the jewelry and skin. Cosmetics that are mainly applied to the face over long periods of time and on a daily basis. Dust and fibers including organic and inorganic dusts, metal filings and fiberglass. Gloves, both latex or rubber, may cause irritant contact dermatitis mainly associated with the powder used as drying agent in these gloves or heat and sweat build up with prolonged glove use. Water including tap water, untreated freshwater from natural sources, distilled water or saltwater. Environmental factors especially dry, very cold or hot climates which affect the natural moisture and health of the skin. Tight or rough clothing and undergarments may also cause irritant contact dermatitis is used frequently. Red and raised over the entire affected area or there are several bumps interspersed among fairly unaffected skin. Dry, cracked and sometimes peeling patches of skin. Blisters oozing fluid sometimes with crusting. Clearly demarcated skin rash confined to the area exposed to the irritant. Itching is very prominent and pain and tenderness may also be present. Itching or rash that starts shortly after exposure or even days after but usually with the first 2 weeks. 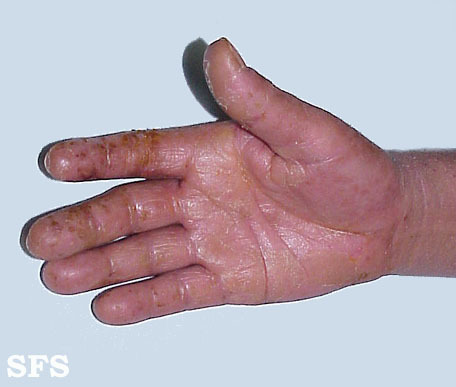 Dermatitis limited to the hands since this part of the body is more often in contact with irritants. Symptoms improve or even totally resolve once a person is not exposed to the irritant. Pus from the affected site. Excessive swelling and intense heat. Rash that is rapidly spreading. Fungal infections cause less intense symptoms but are usually more persistent and take longer to treat. In the hands, these type of fungal infections caused by dermatophytes are known as tinea manuum and if it involves the nails then it is known as tinea unguium. Pictures of contact dermatitis on the armpit and abdomen along the waistline. The most effective way to treat irritant contact dermatitis is to find the exact irritant or possible irritants and avoid contact with it. Even otherwise innocuous substances may be potential irritants and should be avoided for a period of time to confirm or exclude it as a possible cause. Substances marked as ‘hypoallergenic’ may still cause irritant contact dermatitis and are not necessarily the safe choice. Wash the affected area regularly with cool water. Running water will flush out the irritants. Emollients that moisturize the skin or thicker applications like petroleum jelly that act as a physical barrier thereby reducing skin contact with the irritant. Corticosteroids (oral or topical) to reduce inflammation. Antibiotics or antifungals to treat secondary infections.